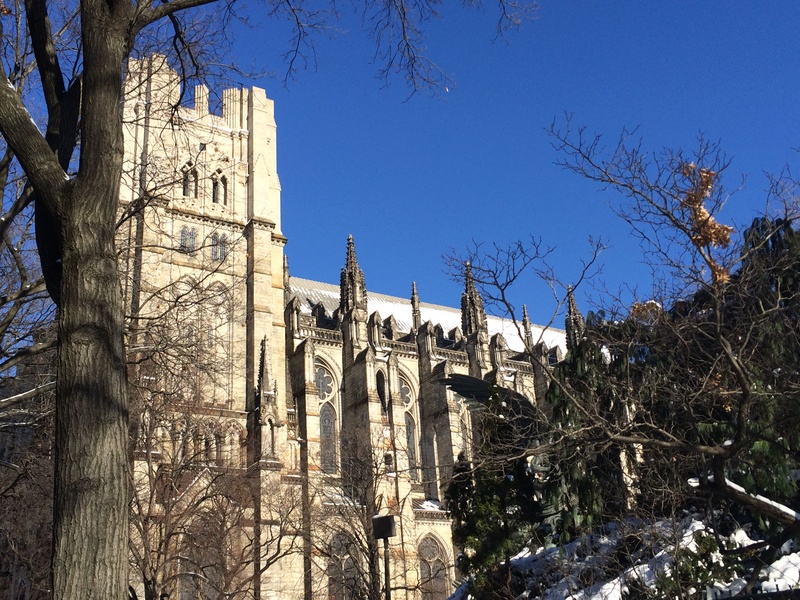 On this chilly afternoon, we paid a visit to the Cloisters in northern Manhattan. We wandered the galleries, and immersed ourselves in the intricate detail and vivid, sometimes lurid imagery of medieval art. The rosary bead below is just over 2 inches in diameter, and features astonishingly detailed scenes of Christ’s life and crucifixion. Not much bigger than a walnut shell, the little box puts me in mind of Hamlet’s speech to Rosencrantz and Guildenstern: “I could be bounded in a walnut shell, and count myself a king of infinite space – were it not that I have bad dreams.” The thought of being bounded in this particular walnut shell with its tiny depiction of martyrdom and crucifixion is certainly enough to give me bad dreams. The rosary bead also evokes a nutshell that the white cat gives to the youngest prince in Madame d’Aulboy’s fairytale, The White Cat. 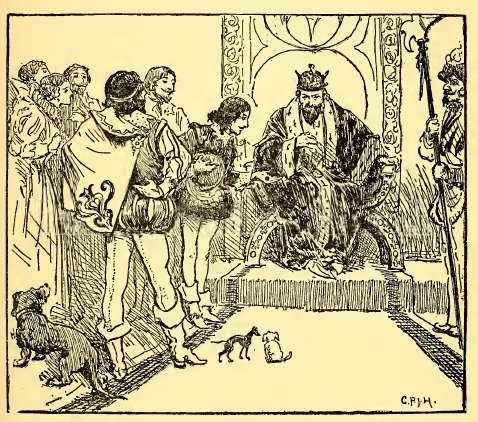 To win the kingdom, the King’s three sons spend a year seeking the tiniest, most beautiful dog in the world. One of the older princes buys up all the dogs. At the end of the year, each of the two elder sons presents a tiny, beautiful dog to the king, and feels assured of success. Images of dogs and other animals, real and imagined, domestic and wild, abound at the Cloisters, including birds, lions, fish, dragons, unicorns and a most marvelous camel. After we’d spent a couple of hours surrounded by reliquaries and sepulchers, we craved fresh air, and looked yearningly through the windows into the Cloister gardens. But they were closed due to the cold. 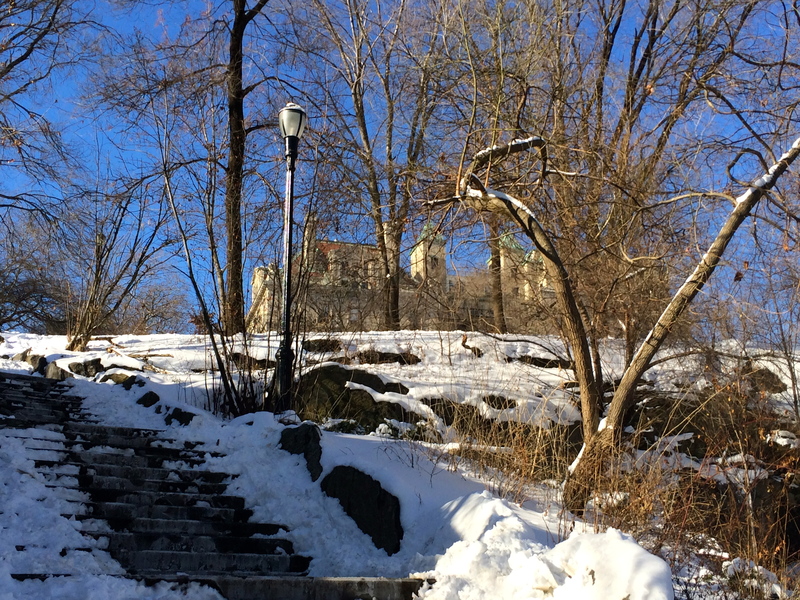 So we left the museum, our heads full of images, and strolled out into Fort Tryon Park. 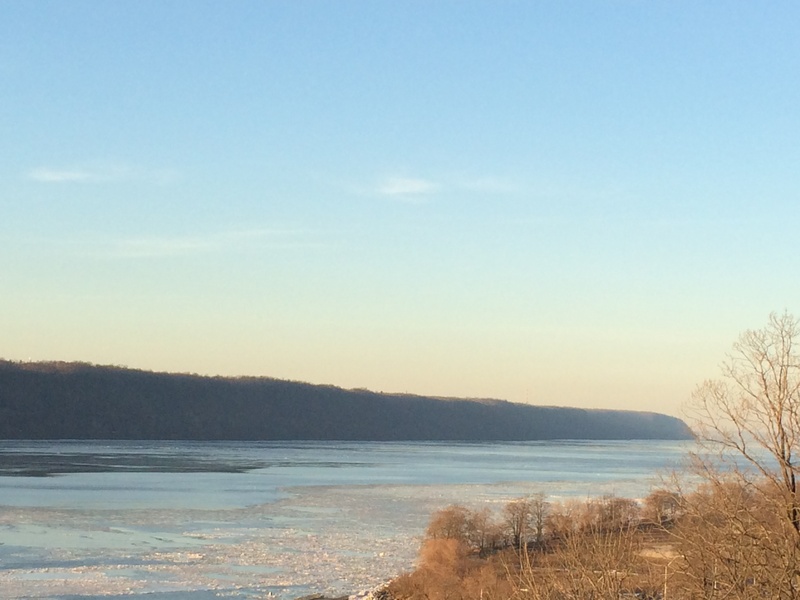 We gazed west across the partly-frozen Hudson River, then walked north. 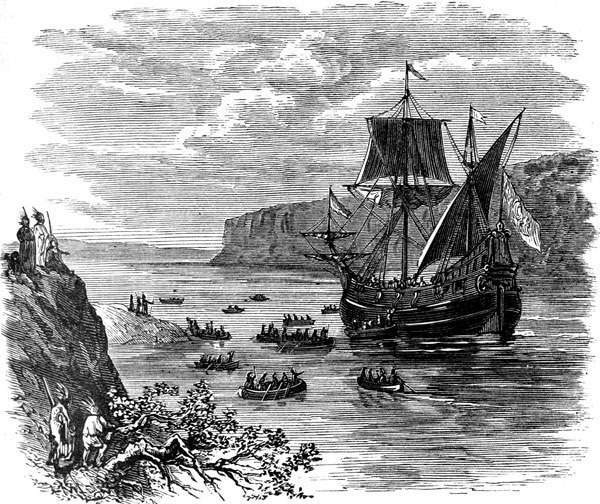 We thought about Henry Hudson sailing up the river in 1609 into unknown territory. Hudson, we realized, was born in the 1560s, not so many years after the creation of that extraordinary 16th-century rosary bead with its still medieval sensibility. 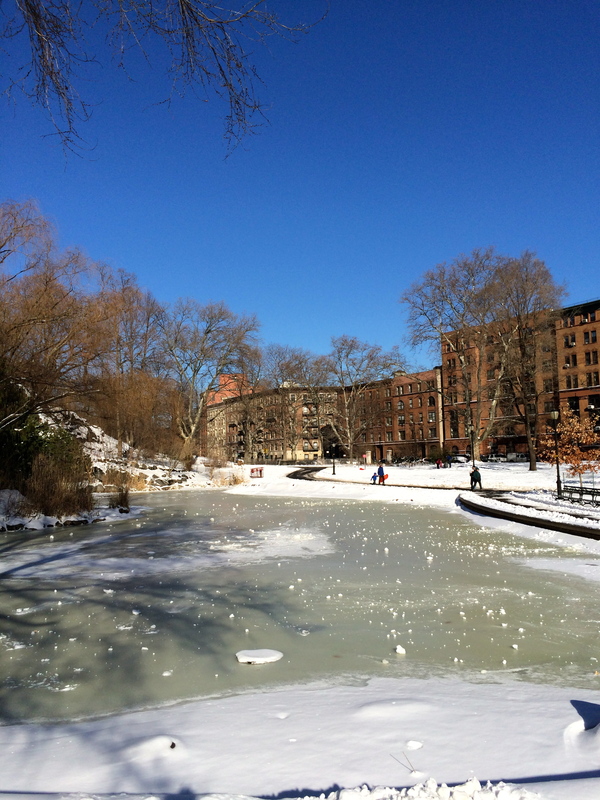 The thought seemed to connect us, our river, and our modern city (developed in the wake of Hudson’s voyage) with the seemingly much more distant world of the Middle Ages. Then the cold air and the icy river prompted us to think of Hudson’s second voyage to the New World, when he entered what is now Hudson Bay, Canada. 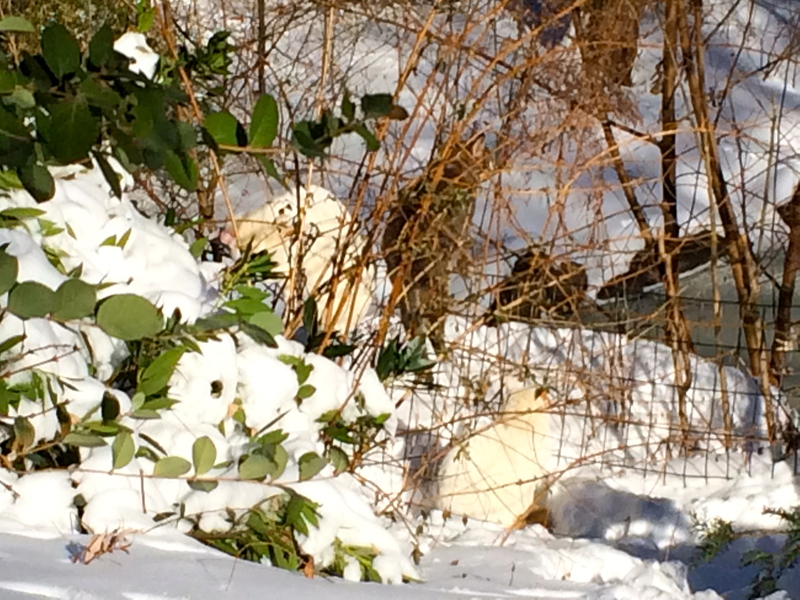 After barely surviving a hungry winter trapped in ice, the crew, desperate to return home, mutinied. They set Hudson, his son and his followers adrift in a small boat to die of exposure in or near Hudson Bay. 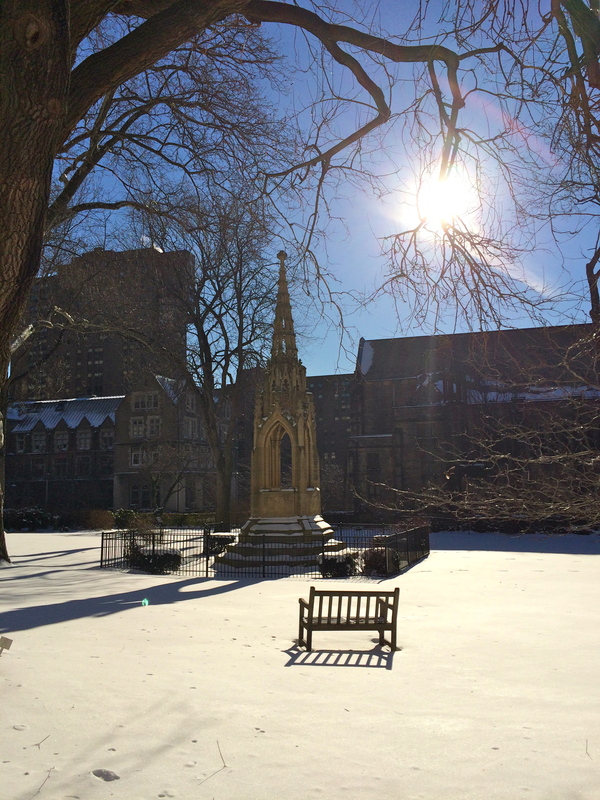 It’s cold down here. But not that cold. 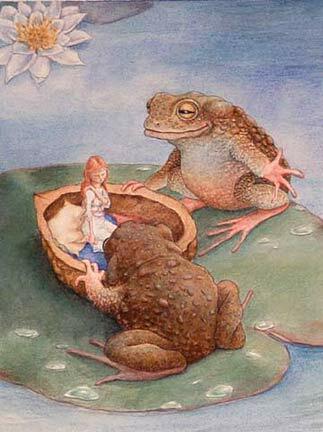 Thumbelina in a walnut shell. 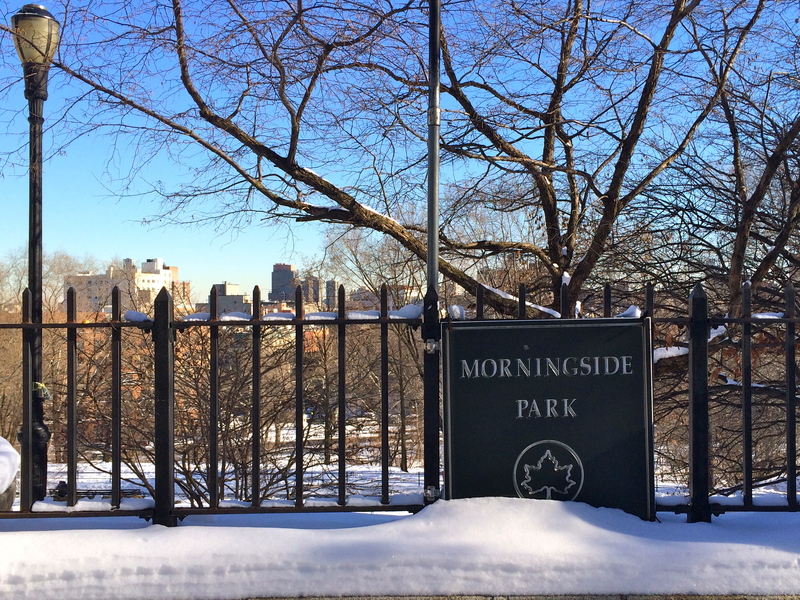 Morningside Park is always magical in the snow. The little pond was frozen solid. 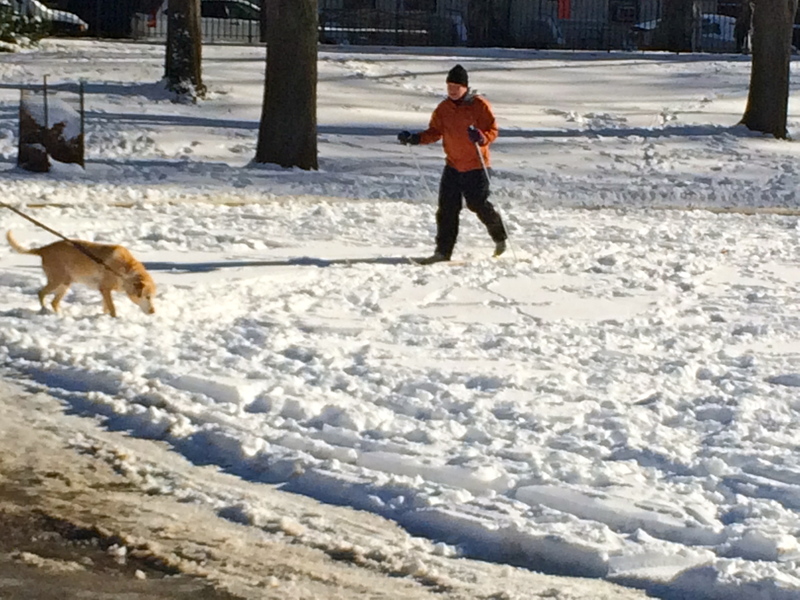 Cross-country skiers slid across the fields, and dogs sniffed and romped. 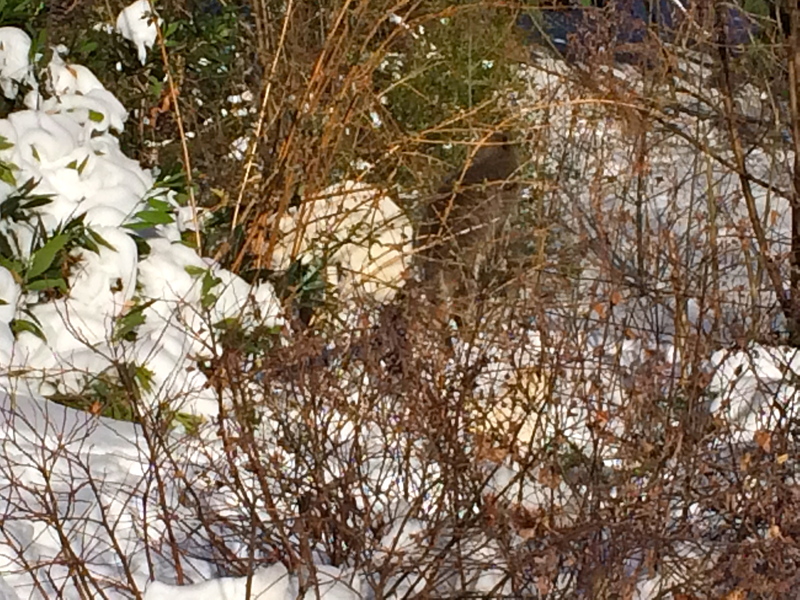 A white cat is balanced in the twigs, a gray cat is perched in the wire fence, and a white-and-black cat sits on the snow to the right. Saint Luke’s Hospital loomed over us as we continued our climb. 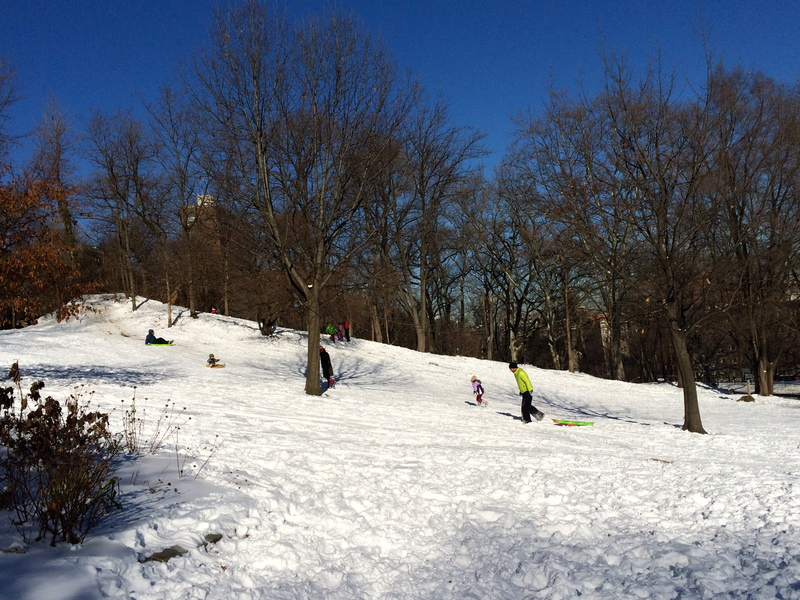 Sledders were at play on the slope just below Morningside Drive. On the street, the back of Saint John’s Cathedral invited us to explore. 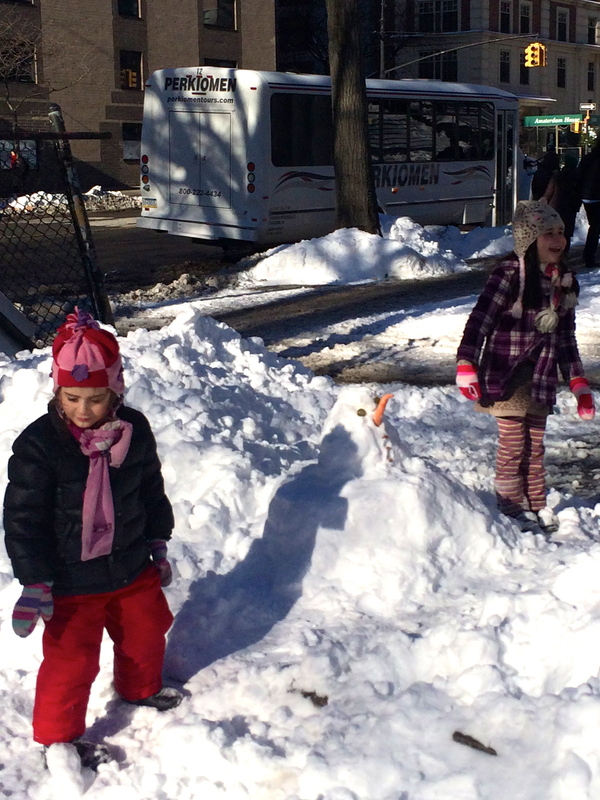 We walked over to Amsterdam Avenue and the unfinished towers at the front. 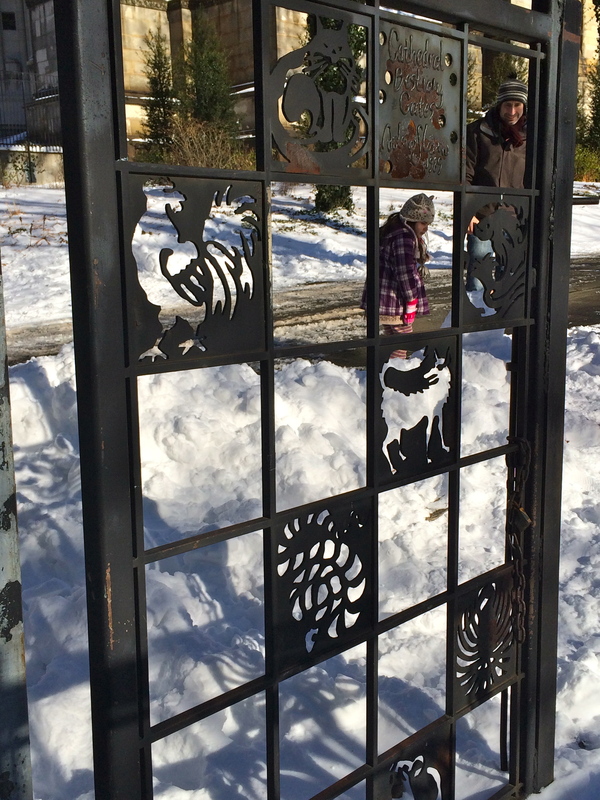 We entered through the animal gates. 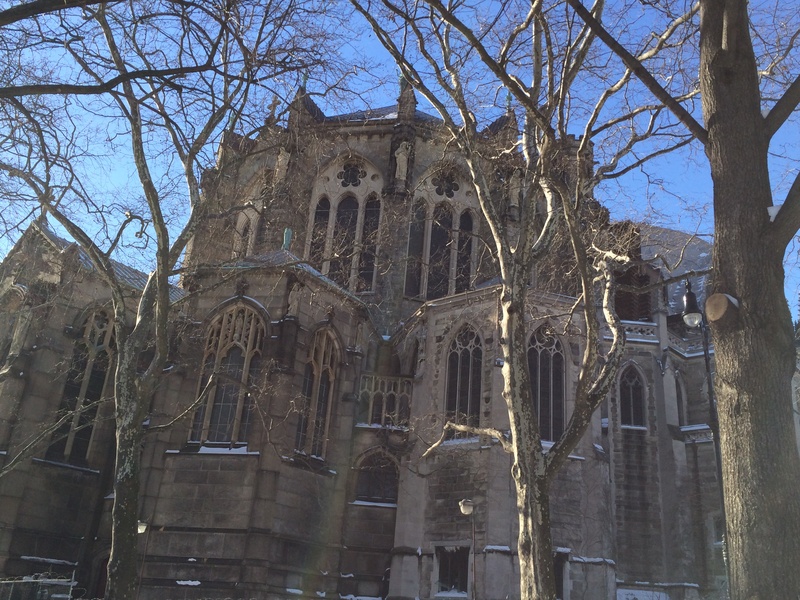 Leaving behind the would-be cannibals, we headed into the Cathedral grounds. 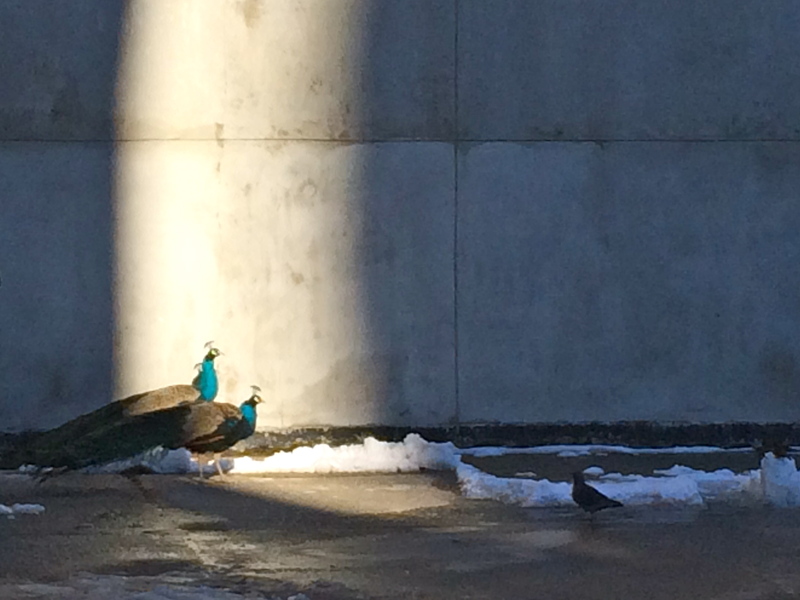 We spotted the resident peacocks. First one. 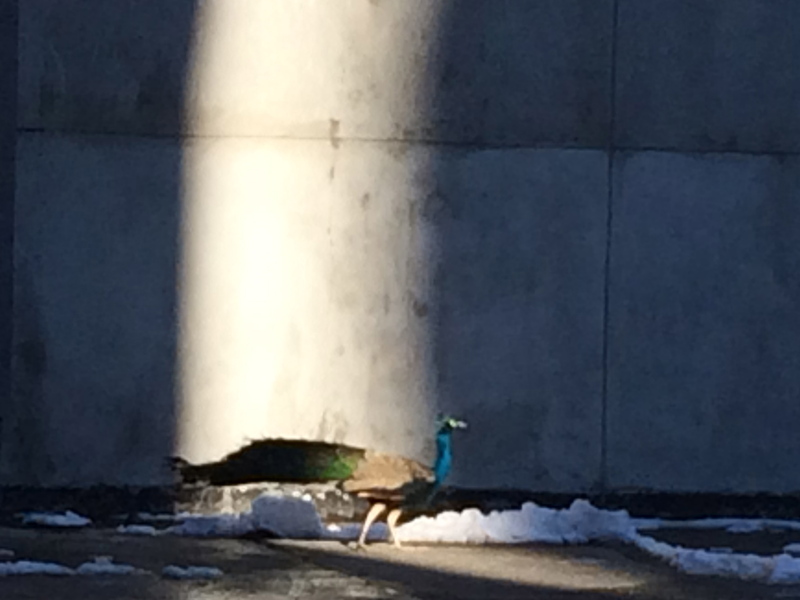 And finally, three as Phil, the white peacock, preened inside the peacock house. A group of teenagers came clattering up the path. The girls squealed and shrieked when they saw the peacocks, running toward them to take pictures. 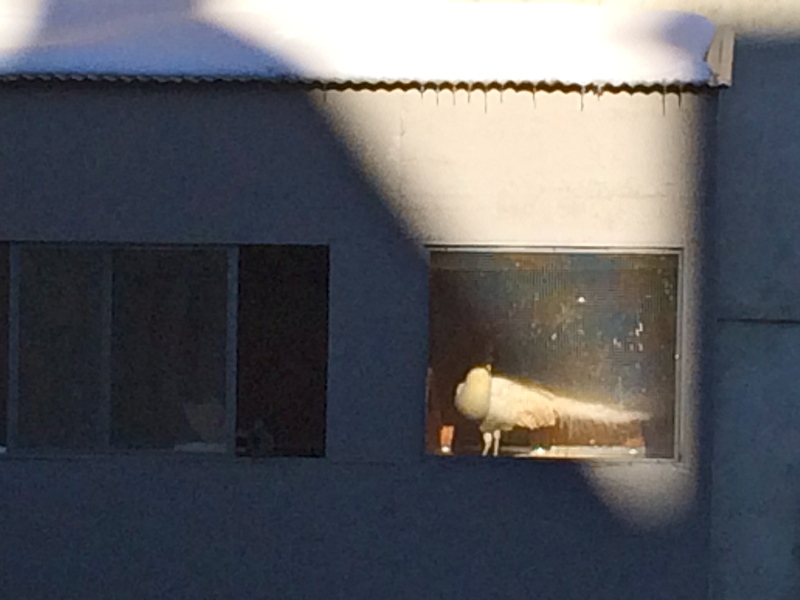 The birds, accustomed to paparazzi, ignored the girls, even the one shivering in a strapless dress and bare legs. Humans. What can you do? 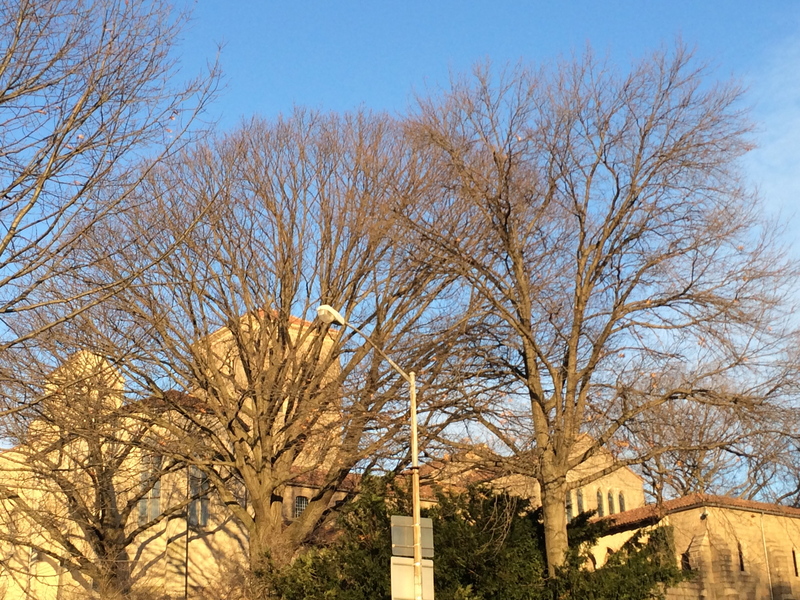 We gave a last look up in search of the neighborhood red-tailed hawks, but no hawks today. 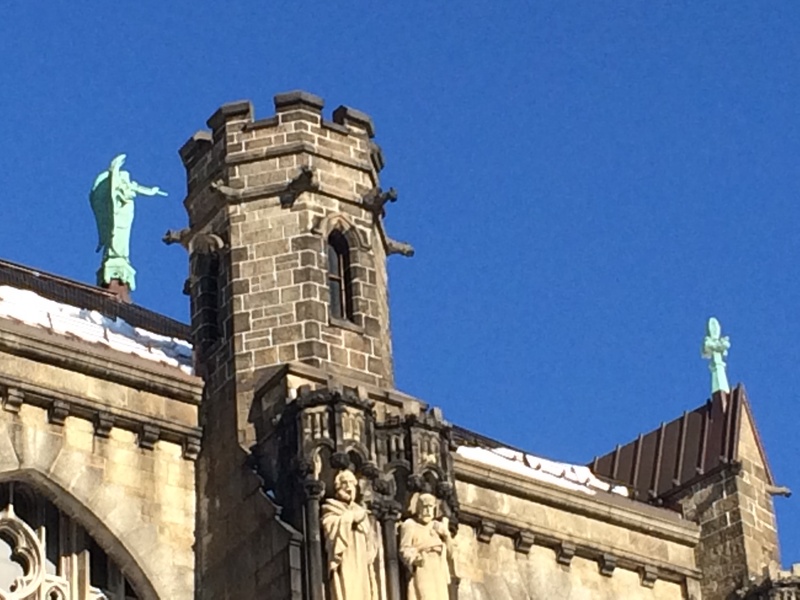 Just Gabriel forever blowing his horn atop the Cathedral as the stony apostles wait patiently in the cold.